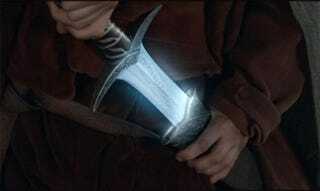 WarSting is a replica of Bilbo Baggins' famous sword Sting, with a twist: instead of glowing blue when it detects Orcs, it glows blue when it picks up an open wi-fi network. You can't buy WarSting, but you can make it. Make: have a guide up showing how all you need is a particular brand of replica toy Sting and a Spark Core, which is a "Wi-Fi development kit with a reprogrammable chip that has a Wi-Fi module and can interact with sensors and actuators like the ones in the toy sword".